The beloved New York Times bestselling author of Wicked reimagines Andersen’s “The Little Match Girl” for modern readers, putting a new twist on a timeless classic. 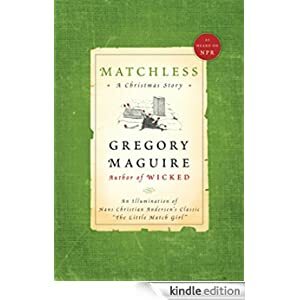 In Matchless, Gregory Maguire adds a different dimension to the story, exquisitely intertwining the match girl’s tale with that of Frederik, a young boy who builds a city out of trash, and whose yearnings are the catalyst for a better future for himself and his family. Maguire uses his storytelling magic to rekindle Andersen’s original intentions, suggesting transcendence, the permanence of spirit, and the continuity that links the living and the dead.